Back in Issue #37 I wrote a short article about using High Radius / Low Amount (HRLA) unsharp mask to add some snap to your images. This is a quick and effective technique which I have used a lot – that is until I came across a little bit of software from a clever chap called Davide Barranca. This ‘panel’ for Photoshop CS5 (as well as CS3 and CS4) achieves a very similar result – adding punch and definition to an image through enhancements to the local contrast. What sets it apart from the HRLA method is that there are no hue shifts and no halos, plus it is very effective on areas of smooth transition as well as defined edges. I chose this image as an example because it has areas of both low frequency (the water) and high frequency (the rock texture). So, what’s going on? Well I wish I could tell you, but there are some clever things going on under the hood that the developers want to keep to themselves. Essentially it exaggerates the definition within the image – edges are emphasised, not sharpened per se, textures are made more distinct and hazy areas of the image become more defined. It won’t clip highlights, a danger with the more crude HRLA method, it uses the L* channel from L*AB space to avoid hue and saturation shifts, and, somehow, there are no halos around the broader transitions from bright to dark. The panel itself only has one control – a slider to set a Radius. From what I gather this radius is not an area of effect, like in USM, its more like a sensitivity to edges – Davide Barranca uses the analogy of breaking down an image into varying sized tiles and working within each tile. The smaller the tiles the more ‘local’ the effect. Certainly there is a degree of difference between 1 and 200 but it’s not simply one of amount. The effect of a radius of 1 is distinctly more pronounced on the rock texture than on the water. 200 emphasises the water textures most, since it’s working very ‘broadly’ and has little effect on the micro contrast of the rock. The effects are also very image dependent so you really need to run the routine at the default of 100 to see what happens then either run it again at a different setting or use the opacity slider to moderate its effect – ‘season to taste’ as they say. Not only is ALCE image subject dependent but it’s also image size dependent so images from a 10MP camera will need different settings to those images from my 40MB camera. When you run ALCE it will simply add a new layer called ALCE (Radius) so you know that the layer called ALCE 100 was run at a radius of 100. You can then use blending modes and masking to temper and control the effects of the routine. An added feature is the ability to batch files – ALCE will apply the same setting to all images in a specified folder. If you get the Layers option checked you can go back and adjust the opacity of those images where the effect is too strong. The website (referenced below) has lots of examples of how effective ALCE. In fact it would not be an exaggeration to say that some of the examples are quite stunning. Better yet, Davide Barranca has recorded some in-depth video tutorials to explain the subtleties of the process. The second one, Advanced Masking and Tweaking, is very technical and you may learn something about other aspects of Photoshop too. I use ALCE as part of my main workflow. Very few images will not benefit from a bit of a boost and, remember, what you see on your screen will be much more contrasty than a print. 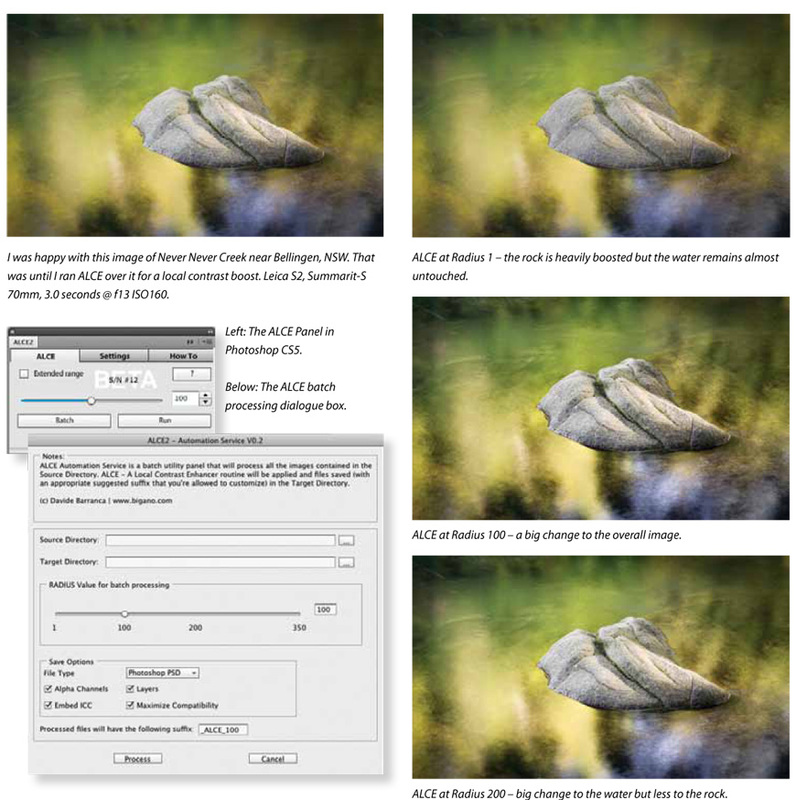 Giving an image a quick once over with ALCE will lift your print quality without a shadow of a doubt. ***Highly recommended and at US29 a bargain. Better Digital Camera is one of three magazines published by the Better Publishing Group, the others being Better Photography by Peter Eastway and Better Photoshop Techniques by Philip Andrews. “My magazine is slightly oriented towards gear, you’ll find full reviews and lots of info about using camera equipment in the 124 pages that make up each issue”. 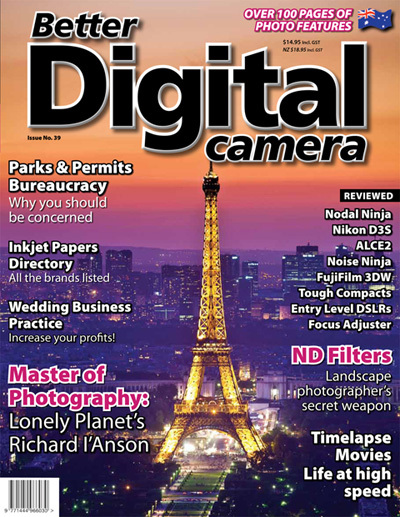 BDC (Better Digital Camera) is published quarterly, and this means that we have a very long lead time. Typically I have to have an issue ready for printing at about the same time as the previous issue hits the news-stands. Consequently I’m often thinking 2 issues ahead and it also means that if something is started in one issue, it might not be fully running until two issues later. Reader Images are a good example – this was announced in Issue 34 but it’s not going to really get up and running until Issue 36, due out in January 2010. I’ve already had entries as I write this – thank you – so please be patient as they won’t appear for 6 months yet! BDC has the most content of all the photography magazines – about 100 pages per issue are full of photographic information and we try to be the best value around. This website is a new venture too – I plan to start adding important news here, in advance of the print version, so it can be more topical, and I can also Blog about what’s happening in my own world of pro photography. We warmly suggest you to subrìscribe to this magazine. It’s very rich of contents. BDCM is based in Australia, but they accept subscriptions from worldwide. The price of subscription ranges from $51.80 to $69.00.